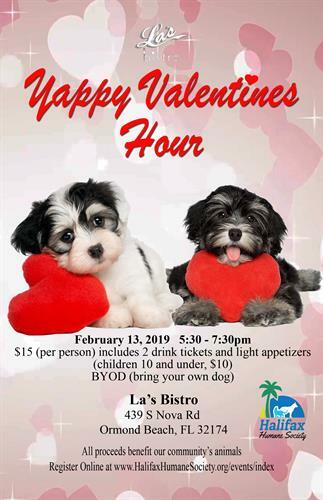 Take your best friend out for a romantic evening and join us for a special Valentine's Yappy Hour at La's Bistro on February 13th at 5:30 pm - 7:30 pm. $15 per person includes 2 drink tickets and light appetizers. (children 10 and under, $10) All proceeds benefit HHS. All proceeds benefit our community’s animals. $15 per person includes 2 drink tickets and light appetizers. (children 10 and under, $10) All proceeds benefit HHS.